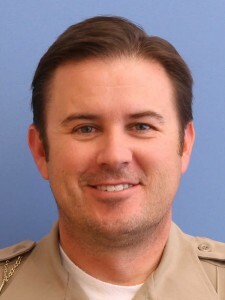 UTAH COUNTY — A Utah County Sheriff’s Sergeant was shot and killed and a deputy wounded by gunfire on Thursday after a lone gunman went on a rampage through Utah County and on into Juab County before being shot and wounded by deputies there. At about 1 p.m., Thursday, Utah County Sheriff’s Sgt. Cory Wride, stopped on state Route 73 near mile marker 31 between Eagle Mountain and Cedar Fort to help someone in what appeared to be a disabled vehicle, according to a statement issued by the Utah Sheriff’s Department. A short time later dispatchers with Utah Valley Dispatch Special Service District were unable to reach Wride, the Sheriff’s Office said, and deputies responded and discovered he was still in his patrol vehicle and had been shot. Wride, 44, died at the scene. He was beginning his 20th year with the Sheriff’s Office and leaves behind a wife and five children. Investigators were able to get a description of a possible suspect vehicle to agencies throughout Utah County and surrounding counties. At about 2:51 p.m.. a deputy with the Utah County Sheriff’s Office located the suspect vehicle near Main and Center Street in Santaquin and a pursuit ensued. During the course of the pursuit, according to the Utah County Sheriff’s Office, a suspect fired shots at the pursuing deputy, Greg Sherwood, 38, and struck the deputy in the head. Sherwood was hospitalized at Utah Valley Regional Medical Center in Provo and underwent surgery Thursday. He is expected to recover, Utah County Sheriff’s Office said. The suspect fled into Juab County and in Nephi he tried to hijack several different vehicles and then did hijack one, Utah County Sheriff’s Office said. He then fled south on I-15 through Juab County where he reportedly lost control of the stolen vehicle, crossed through the median in front of northbound traffic, and crashed into a fence at about 3:20 p.m.
Juab County Sheriff’s deputies arrived at the crash and the suspect fired shots at them, Utah County Sheriff’s Office reported. Juab County Sheriff’s deputies returned fire, hit the suspect, and were able to take him into custody. The suspect, who was not being identified, Utah County Sheriff’s office said, was taken to Utah Valley Regional Medical Center in Provo, where he also underwent surgery and is expected to survive. This is a very broad investigation with four reported crime scenes and many different agencies involved across 50 miles and two counties. One of the agencies involved, the Utah Highway Patrol, is asking for anyone who might have witnessed the incident or has any information to call a tip line at 801-887-3800. As of 8:35 p.m Thursday the Utah Department of Transportation reported that Interstate 15 northbound remains closed and is shut down between mile posts 207 and 222, south of Nephi and is estimated to be closed until Friday morning. I-15 drivers are being routed through Levan. At About 7:30 p.m., southbound lanes were reopened. Condolences to Sgt. Wride’s family, friends and coworkers. Prayers for the complete recovery of Deputy Sherwood. I know this has to have shaken the Utah County S. O. to it’s core. As to the suspect, I sincerely hope he was gut shot, and is being given no pain mediation whatsoever. So dreadfully sorry to hear about Sgt. Wride, and also sorry to hear that the suspect survived his injuries. He seems hardly worth the trouble of the healthcare workers.